Summary In this project, 34 low-rise houses and 37 dwellings in an apartment building in the Amsterdam Nieuw Sloten quarter have been provided with solar power. On the high-rise apartment building, solar cells have been placed both on the roof and the balconies. The design of the roof of two penthouses on the top of the building was slightly adjusted by the architect, optimized to the use of solar energy. 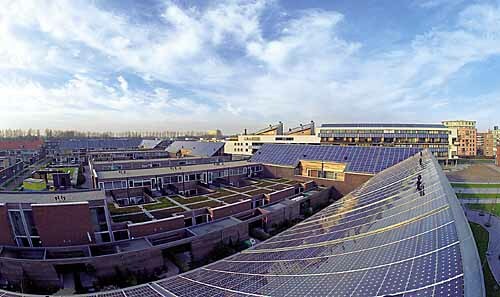 The panels on the low-rise houses and on the main roof of the apartment building, with a total power of 214 kWp, are connected to a central 150 kW inverter. For this purpose, a local DC (direct current) grid was realized. The panels on the façade of the apartment building and on the roofs of the penthouses are connected to separate inverters. The alternating current from all inverters is collected in a central inversion room.